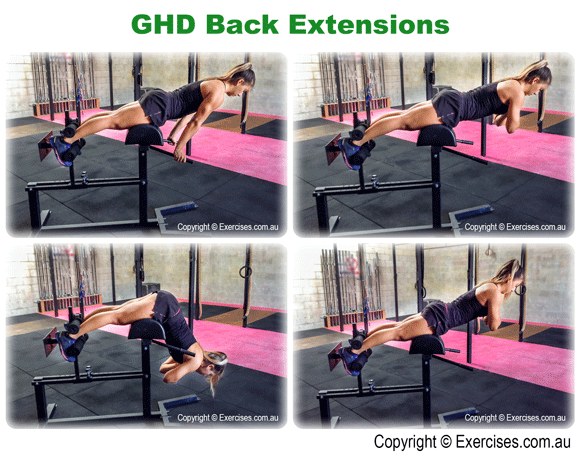 GHD Back Extensions or Glute Ham Developer is a great exercise for targeting the posterior chain which includes gluteus muscles, hamstrings and lower back. There is secondary emphasis on the hip flexors and abdominal muscles. GHD Back Extensions can be used as a warm up before training your back, legs particularly in exercises such as Deadlift and Squat. It can also be part of your regular rotation for lower back and hamstring work. This exercise will build muscle and help improve flexibility and mobility. The first thing you need to do is to set up the GHD Extension machine. If it is not bolted on the floor, place dumbbells that are heavy enough on its base. Adjust the heel pad so that your ankles will be secure. Adjust the height of the hip pad so that at the top position, your hip is at the front of the pad and that your upper back will be aligned with your lower back and heels. At the start position, make sure your body is in perfect, straight alignment. Cross your arms in front of your chest. Lower your body under control until the point where your upper back and lower back are at a 90 degree to the floor. You should feel a nice stretch on the lower back, glutes and hamstrings. Explosively extend your body upward until it is slightly above parallel to the floor. You should feel a contraction on your glutes, hamstrings and lower back at the top position. Hold it for a count of “one”. Return to the bottom position by lowering your upper body under control. The most common fault in GHD Back Extensions is not contracting the glutes and just rounding out the upper back. This reduces the muscular tension on the glutes, hamstrings and lower back.